Offered is an Edwardian green silk dress with a gorgeous net lace neckline and flounce in an embroidered floral garland pattern highlighted in bronzy gold metallic threads and accented with a silk flower corsage at the waist. The high-sheen semi-sheer green dress has a tulle overskirt with a 12" scalloped flounce of the embroidered net lace completely around hemline - there's a lot of lace. In addition, there is another layer of four long pieces of plain tulle that end in points (or did) attached at the waist - these four pieces of tulle and the tulle cap sleeves are in very bad condition and would need to be removed/replaced. 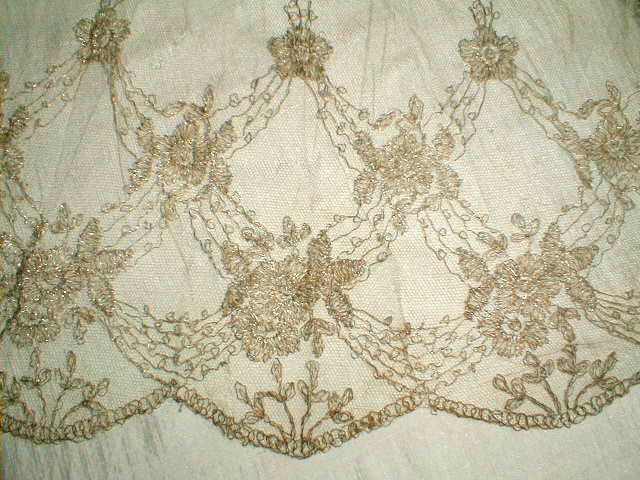 The tulle overskirt has a very dark large rust stain and some tearing away from seams. 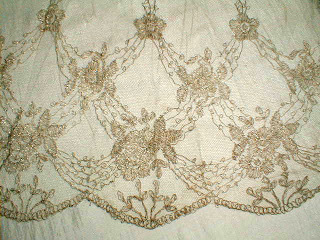 The embroidered net is a bit fragile with some net holes but the embroidery seems to hold it together very well. 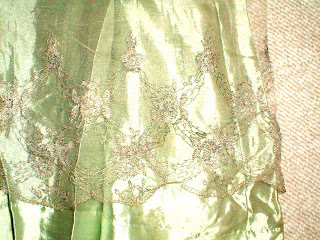 The green silk seems strong though it has soil (including underarm stains) and uneven fading - most of the skirt is good. 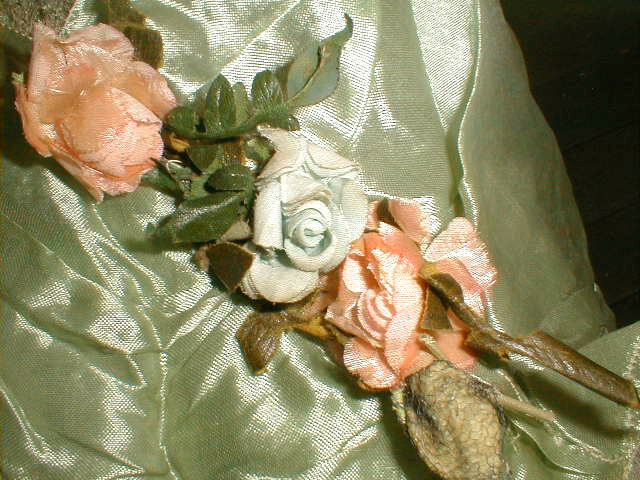 Silk flowers are a bit flattened. With some restoration, I feel it could be worn. Can be used as pattern, display or individual parts reused. Cleaning is recommended - dust/soil and faint odor from age/storage. 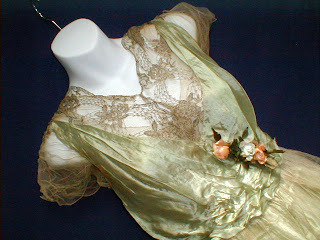 Two more Edwardian dresses from the same estate sale are being offered in my other auctions. 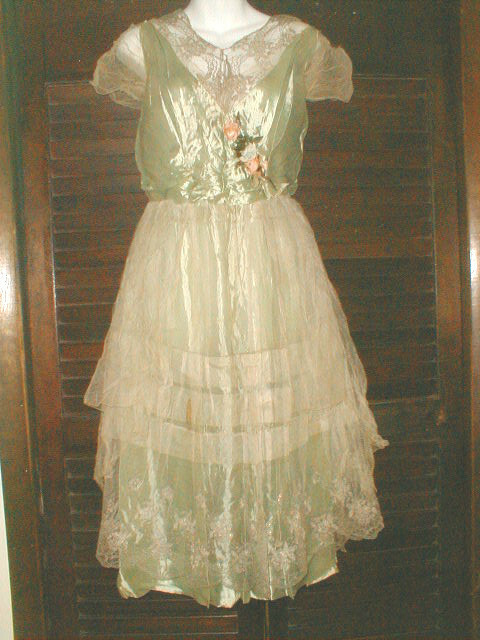 Unfortunately, the seller didn't provide pictures of the back or inside but based on what we do have, I'm saying roughly WWI time frame.